Slow Club is Sheffield boy-girl duo Charles Watson (guitar, vocals, piano) and Rebecca Taylor (drums, vocals, guitar). The band formed in 2005 when they were both still teenagers and spent the next two years touring relentlessly around the North of England. Initially categorized as “anti-folk” the album proved there was so much more to the band and their sound – sweet harmonious hooks, rockabilly beats and exuberant yelps and yips, all held together by some breath-taking harmonizing. 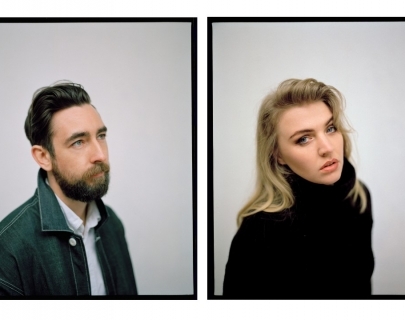 Slow Club are defined by their own distinct and powerful partnership – Charles with bruised vocal, rasping guitar and disarming lightness of touch; Rebecca with her dash of Northern Soul and sharp wit, switching between vocals and drums like Beyonce crossed with Karen Carpenter. Now we find them in 2016 heading into the studio again, this time with Matthew E White. Where this latest collaboration will take them is anyone’s guess. But wherever they go you know it will be worth your while to follow.